Commencement is a grand event but signing diplomas is a reminder that small things matter. Each time I put pen to paper, with each signature there is a memory and a promise. Such a small act, the signing of diplomas. But with time I've come to realize the power of small actions—that small things, smartly done, can bring about magnificent change. If we forget those details, lose track of the small, our big ideas will never become real. It is in the small that we recognize the humanity of those whose lives we wish to make better and the necessity of understanding the details of those lives in the recommendations we make and the change we lead. For each of you, our newest graduates—be bold. Think big. But don't forget the value of the first small act and appreciate the details of the lives you wish to change for the better. For each of you, as I read your names, I realized that each signature was a prayer, wishing for you the brightest of futures. It was a small act that signified the commencement of your fulfilling the tremendous promise of your lives. Today you are taking that step and there is no doubt that magnificent change will follow. 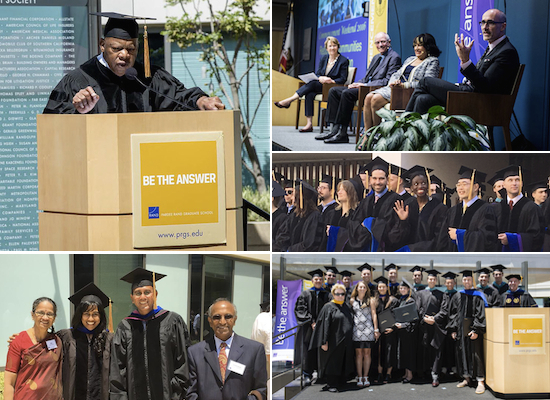 On June 16-18, the Pardee RAND Graduate School hosted a series of events to celebrate the 2016 Pardee RAND commencement weekend. Festivities kicked off at Thursday's alumni and student mixer, which you can read more about below. On Friday, the school hosted a policy dialogue on "(Re) Building Communities," featuring honorary degree recipients Carolyn Meyers, president of Jackson State University, and Warren Olney, host of the syndicated public radio show To the Point and KCRW's Olney in L.A., along with Pardee RAND alum Arthur Brooks (cohort '96), president of the American Enterprise Institute (AEI). The dialogue was moderated by Dean Marquis with an introduction by Dr. Pedro José "Joe" Greer, Jr., RAND trustee and chair of the Pardee RAND Board of Governors. The evening's activities included a celebratory dinner for alumni, graduating students, and other members of the Pardee RAND community. The dinner featured the presentation of the third biennial Alumni Leadership Award to Brooks (see article below), and a tribute thanking Donald B. Rice, RAND trustee and member of the Pardee RAND Board of Governors, for his extraordinary leadership as chair of the school's Be the Answer fundraising campaign. Saturday's commencement ceremony featured an address by honorary degree recipient Rep. John Lewis. Honorary degrees were also presented to Meyers, Olney, and Joseph Newhouse, the John D. MacArthur Professor of Health Policy and Management at Harvard University and key architect of the RAND Health Insurance Experiment. In her graduate address, Sinduja Srinivasan (cohort '09) noted, "Being the answer isn't static. It's flexible and adapting to different environments and situations. It isn't a formula we can crunch to churn out a canned response. To me, being the answer is to think, to explore, to interact." Pardee RAND awarded 45 doctoral degrees in policy analysis and 46 master's degrees during the ceremony, which was attended by more than 400 people. Pardee RAND Alumni in attendance Friday, top row, left to right: Edmundo Molina-Perez, Hui Wang, Joshua Weed, Rehan Malik, Amber Moreen, Mary Anne Doyle, Jeremy Kurz, Sarah Evans, Marlon Graf, Nelly Mejia, Nolan Sweeney, Megan Clifford, Ed Conrow, Lindsay Daugherty, John David Pinder, Bruce Wetzel, Ted Harshberger. Bottom row: David An, Jessica Yeats, Ujwal Kharel, Michael Scarpati, Arthur Brooks, David Johnson, Phil Romero, Eric Warner, Evan Bloom, Sarah Kups, Greg Midgette, Sinduja Srinivasan, Brooks Stearns Lawson, Teresa Taningco Kaldor, Diana Epstein, Loren Yager, Jodi Liu, Aviva Litovitz, Ashley Pierson, Myles Collins, Michael Beltramo, Jonathan Wong, Mollie Rudnick. 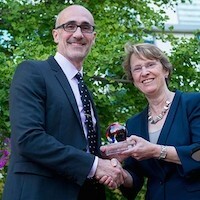 Arthur Brooks receives his award from Dean Susan Marquis. Arthur Brooks (cohort ’96) received the Alumni Leadership Award on June 17 at the celebratory dinner during commencement weekend. Brooks' career and publications span a wide breadth of issues and ideas, emphasizing the intersection of public policy, culture, and economics. He is the author of several best-selling books; is published frequently in the Wall Street Journal, New York Times, and other major newspapers; and can be heard often on talk shows as well as in his recent, popular TED Talk, "A Conservative's Plea: Let's Work Together." In his current role as president of the American Enterprise Institute, Brooks works with leaders in business and politics to further the ideals of free enterprise and increased opportunity across the country. Pardee RAND was excited to welcome our first Cazier Practitioner in Residence, Paul De Martini, for a week in April. His visit was made possible by the John and Carol Cazier Energy and Environmental Sustainability Initiative. De Martini is a fellow of ICF International and member of the CalTech faculty, where he serves as an expert in smart grids, power grid modernization, and power distribution—the future of energy in the United States. 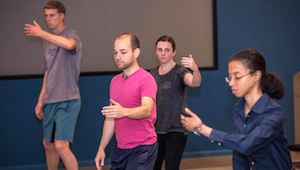 De Martini's activities and interactions with Pardee RAND faculty and students included an informal lunch, open office hours, and a set of tabletop gaming exercises. Pardee RAND's Coordinating Committee (CoCom) and RAND Health partnered to organize the school's first Mental Health Awareness Day. On April 27, more than 50 students and staff participated in activities including yoga, tai chi, massage, and meditation sessions. 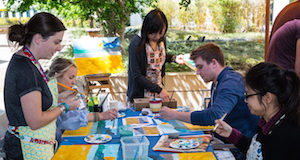 Student Crystal Huang (cohort '13) led an outdoor art therapy session in the third floor courtyard. The purpose of the event was to raise the profile of and take action to address the mental health needs of our students. The day kicked off with remarks by Dean Marquis and an overview of common stress concerns affecting students by RAND's Nicole Eberhart, a licensed clinical psychologist and behavioral scientist. The activities were the first of many initiatives that CoCom and the school's administration are developing. "During the school day he taught us the causes and consequences of market failure but, perhaps equally important, after work hours he blessed us with his vinicultural knowledge and taught us precisely which grape varietals are best paired with cave-aged blue cheese." Nelly Mejia (cohort '11) remarked of Jahedi's unique teaching style: "With his characteristic dry wit he effectively and powerfully guided us towards the realization that not even we are 'econs'—only humans." 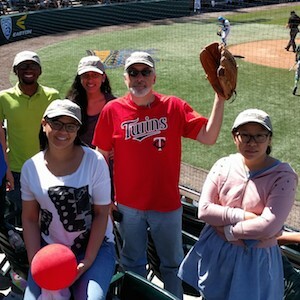 Brown Faculty Fellow Steven Popper introduced several international students to the lively pastime of American baseball on April 23, when they attended a UCLA Bruins baseball game at Jackie Robinson Stadium in Westwood. 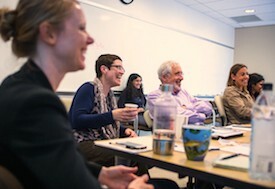 This event was one of several that Popper hosted during his time in residence as the second Brown Faculty Fellow of 2016. One of the primary goals of this program is to enable Pardee RAND faculty members to spend quality time advising and engaging with students. With the goal of developing a sense of community between faculty and students, each Brown Fellow hosts office hours, conducts workshops to present their research, and interacts with students during social events. Pardee RAND students have been busy collaborating on RAND reports and journal articles, as well as many blog posts. Below is one recent release; a full list of student-authored research is available online. Michele Abbott (cohort '14) and Zhimin Mao (cohort '11), alumni David Groves (cohort '01) and Shira Efron (cohort '11), and professors Henry Willis and Jeanne Ringel created the Pardee RAND Food-Energy-Water Index, an online tool for people in the development community to understand the dominant sources of insecurity in a nation and identify cases where many sources of insecurity are interrelated. They also documented how they created it: Developing the Pardee RAND Food-Energy-Water Security Index: Toward a Global Standardized, Quantitative, and Transparent Resource Assessment. All student blog posts and commentaries are available online. Gordon Bitko (cohort '02) is now chief information officer at the Federal Bureau of Investigation. Michael Dardia (cohort '89) is now vice president for finance at the New York Public Library. Shira Efron (cohort '11) was named special advisor on Israel for the Center for Middle East Public Policy at RAND. Mike Egner (cohort '03) is now head of methodology at The NPD Group. Ning Fu (cohort '08) is a research analyst at Econ One Research. She will be returning to USC when her project concludes. 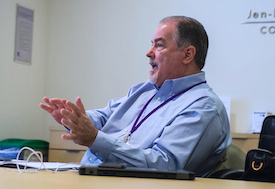 John Haaga (cohort '78) was appointed director of the National Institute of Aging's Division of Behavioral and Social Research (BSR). Matt Hoover (cohort '09) is now a data scientist at Picwell. Mike Scarpati (cohort '10) is now a senior data scientist at Kronos. Helen Wu (cohort '07) is now senior manager, Evidence Services, Care Management Institute, Kaiser Permanente. Conrad Schmidt (cohort '92) visited Santa Monica in April to talk about his work in consulting with the Corporate Executive Board. Also in April, Jeff Tanner (cohort '05) and former Pardee RAND student Harun Dogo (cohort '07) spoke via conference call with students interested in World Bank careers. Before Commencement, Arthur Brooks (cohort '96) gave an informal talk about his non-traditional career path and current role as head of AEI. The following week, Matt Solomon (cohort '98) spoke via conference call with students interested in careers in health policy about his work with Kaiser Permanente's division of research. If you will be in the area (permanently or just visiting) and/or have time to talk with students about your career, please let us know! Mark Schuster (cohort '91) collaborated with RAND colleagues on Two-year BMI Outcomes from a School-Based Intervention for Nutrition and Exercise, published in Pediatrics, based on a randomized control trial they recently conducted. Bradley Stein (cohort '97) and RAND colleagues wrote Campus Climate Matters: Changing the Mental Health Climate on College Campuses Improves Student Outcomes and Benefits Society to accompany a journal article in Psychiatric Services and a RAND report, Evaluation of CalMHSA Student Mental Health Online Resources. Mark Albrecht (cohort '73) wrote a commentary, Congested Space Is a Serious Problem Solved by Hard Work, Not Hysteria, for SpaceNews. Jack Riley (cohort '88) coauthored How to Fix Guantánamo's Broken Justice for Newsweek, based on his experience as a member of the Pacific Council on International Policy's GTMO Task Force. Yuna Wong (cohort '00) wrote a commentary in PAXsims, How Can Gaming Help Test Your Theory? Nono Ayivi-Guedehoussou (cohort '09); dissertation: The Determinants of Job Satisfaction among Nurses, Midwives, and Auxiliary Nurses in Health Clinics: The Case of Bénin, West Africa (online version forthcoming). Brian Gordon (cohort '12); dissertation: Deception in Covert Nuclear Weapons Development: A Framework to Identify, Analyze, and Mitigate Future Long-Term Deception Efforts. He is an analyst with the Department of Defense. Marlon Graf (cohort '12); dissertation: Exploring Sources of Innovation in the Knowledge-based Economy: The Case of Los Angeles (online version forthcoming). Christina Y. Huang (cohort '10); dissertation: Improving Diet in Low-Income Communities: Leveraging the Food Environment for Change. Ujwal Kharel (cohort '11); dissertation: The Global Epidemic of Occupational Injuries: Counts, Costs, and Compensation (online version forthcoming). Jodi Liu (cohort '12); dissertation: Exploring Single-Payer Alternatives for Health Care Reform (online version forthcoming). She will begin work as an associate policy researcher at RAND in August. Nelly Mejia (cohort '11); dissertation: Three Essays on Obesity: Food Environment, Attitudes toward Food, and Cash Transfers (online version forthcoming). Jonathan Wong (cohort '12); dissertation: Balancing Immediate and Long-Term Defense Investments (online version forthcoming). He will be a consultant with Boston Consulting Group beginning in January 2017. Congratulations to all, and welcome to the Pardee RAND Alumni Association! 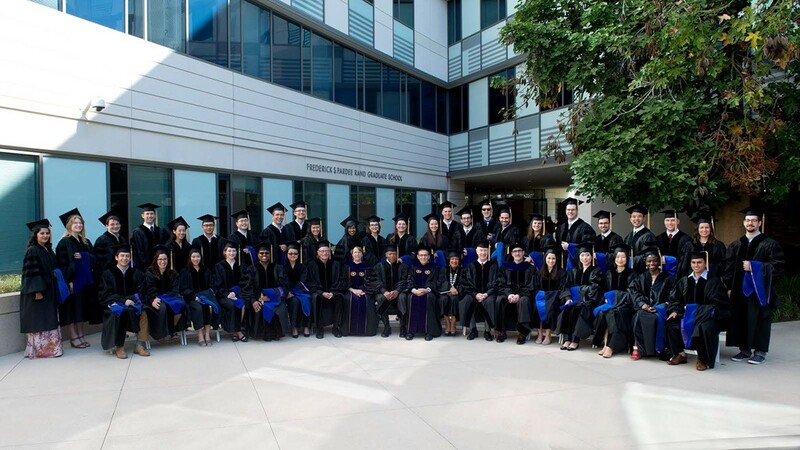 Ph.D. graduates: Standing, left to right: Yashodhara Rana, Susan Burkhauser, Ethan Scherer, David Shill, Christina Huang, Htay Wah, David An, Ahmed Idrees Rahmani, Michael Scarpati, Nelly Mejia, Sinduja Srinivasan, Jessica Yeats, Ashley Pierson, Jennifer Walters, McKay McLaren, Adam Singer, Nolan Sweeny, Evan Bloom, Mollie Rudnick, Eric Warner, Marlon Graf, Jonathan Wong, Jeremy Kurz, Megan Clifford, Greg Midgette. Seated, left to right: Edmundo Molina-Perez, Aviva Litovitz, Jodi Liu, Sarah Evans, Leslie Mullins, Chaoling Feng, Warren Olney, Susan Marquis, John Lewis, Michael Rich, Carolyn Meyers, Joe Newhouse, Arthur Brooks, Beth Katz, Ning Fu, Henu Zhao, Nono Ayivi-Guedehoussou, Ujwal Kharel. Not pictured: Shmuel Abramzon, Shira Efron, Brian Gordon, Abigail Haddad, Shannon Maloney, Michael McGee, Mustafa Oguz, Jordan Rozsa, Elizabeth Wilke. Do you have news to share with fellow alumni? Let us know! On May 25, Dean Marquis visited with New York–area alumni Mike Dardia (cohort '89), Nick Ramphal (cohort '02), and Jessica Yeats (cohort '10) during a dinner at Print Restaurant. 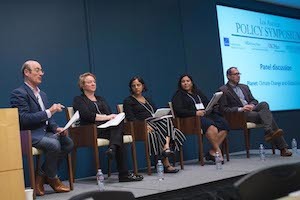 Researchers, faculty, and graduate policy students from the five leading policy schools in Los Angeles County convened for the 11th annual L.A. Policy Symposium. This year's theme was "People, Planet, Profits: Policy Solutions for a Changing World" and featured keynote speaker San Bernardino County Supervisor Josie Gonzales. Students Olena Bogdan and David Manheim (both cohort '12) presented research, and professors Dave Baiocchi and Robert Lempert helped moderate panels. 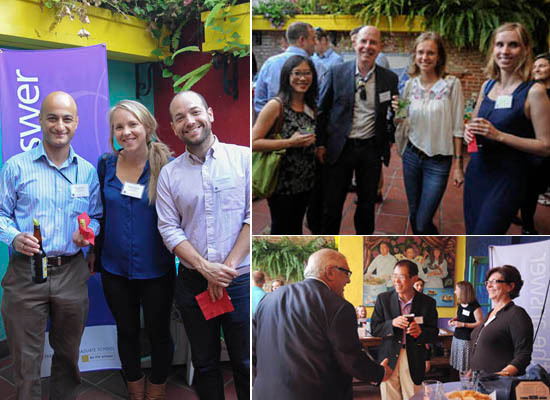 Alumni are invited to a summer celebration to meet and mingle with fellow RAND alumni and to share stories about the ideas and work that have helped shaped RAND and Pardee RAND over the years. This reception will take place at RAND in Santa Monica from 4:30 to 7:00 p.m.; drinks and appetizers will be served. Pardee RAND will host our fourth annual Faculty Leaders Program (formerly the Summer Faculty Workshop) during which we will welcome 12 guest faculty from institutions serving highly diverse student bodies for an intensive workshop in the tools of public policy analysis. The program will include a keynote address on Thursday, July 21, by former RANDite Nicole Lurie, M.D., assistant secretary for preparedness and response, Department of Health and Human Services, about the water crisis in Flint, Michigan. Alumni are invited to attend a reception at 4:00 p.m. and program at 5:00 p.m.
For information about these and other events, please contact Evelyn Fees.